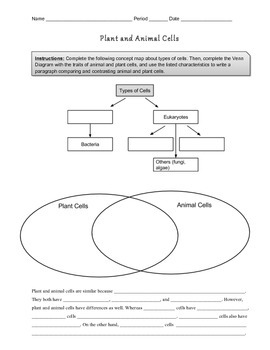 This simple yet effective worksheet allows students to organize and explain information they learn about plant and animal cells. -Concept map of plants and animal cells as eukaryotes (because students so often confuse the comparisons between eukaryotes/prokaryotes and plant/animal cells). 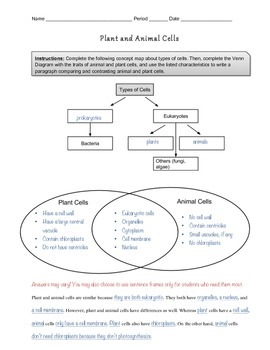 -Graphic organizer of similarities and differences between plant and animal cells. -Sentence frames for a compare-and-contrast paragraph. The guided practice of writing a compare-and-contrast paragraph reinforces the acquisition of academic language, and empowers the student to write well-structured paragraphs in the future. Students often know what they mean to say, but do not have the writing skills to express what they know. This paragraph frame will help them write accurately and concisely, while still giving them the liberty to fill in their own knowledge. Have students preview, draw, or and/or label plant and animal cell photos, images, or microscope slides. Have students read their paragraphs to one another.